﻿ Are Fences the Bridge to a Sustainable Future in Kenya? Are Fences the Bridge to a Sustainable Future in Kenya? “Kenya is destroying itself,” Julius Kipng’etich, director of the Kenya Wildlife Service, told The Observer. “The population has reached an unsustainable level. We are killing ourselves by slowly destroying the forests and settling there.” Drought, poverty, and population growth have led large numbers of the rural poor to encroach on protected forests in search of arable land, reports The Observer, jeopardizing Kenya’s food and water security and hydroelectric energy production. The government’s inability to manage land tenure has further exacerbated the situation. In response to these developments, a local conservation group called Rhino Ark has erected a 250-mile electric fence (see photo slideshow) around the Aberdare mountain range north of Nairobi. When members began the project in 1989, they were attempting to protect the area’s rhinoceroses. However, their efforts eventually grew into a broader campaign to safeguard the Aberdares’ critical water and forest resources. Proponents of the Aberdare fence—including Nobel Peace Prize-winning environmentalist Wangari Maathai—contend that it serves multiple purposes. First, it discourages settlers from grazing livestock in the forest or felling trees to make way for crop cultivation. Other regions of the country—notably the Mau Forest Complex, the water source for millions of people in Kenya, northern Uganda, and southern Sudan—have suffered severe deforestation and degradation, with serious consequences for human and ecological health. Forests provide a wide spectrum of essential ecosystem services, such as regulating the water cycle, filtering groundwater, and sequestering atmospheric carbon. Following Aberdare’s example, the Kenyan government is considering building thousands of miles of fencing around similarly vulnerable forests and parks. Yet fences may soon prove inadequate. The country’s population has grown from 10 million to 36 million over the past 45 years, and it could exceed 65 million by 2050, given that the decline in its fertility rate has stalled. In addition, its GDP per capita has steadily decreased, leaving more than 55 percent of citizens below the official poverty line. With more people clamoring for more resources, a sustainable future will depend on robust community conservation programs and land-rights reform. Successful models of community conservation in East Africa include the Lion Guardians and Il Ngwesi Group Ranch, as well as other efforts discussed at the Wilson Center last year. A 2008 report from the Rights and Resources Initiative argues that authorities should shift away from traditional forms of conservation, which focus on excluding people from protected areas, in favor of approaches that empower local communities to care for and benefit from the land through customary tenure or individual property rights. Finally, Nairobi should craft national forest management practices with an eye toward ongoing international climate negotiations. Policymakers are poised to include provisions for compensating developing countries for reducing greenhouse-gas emissions from deforestation and forest degradation in the next international climate treaty, to be concluded in Copenhagen this December. Kenya could benefit substantially if the government takes appropriate action. 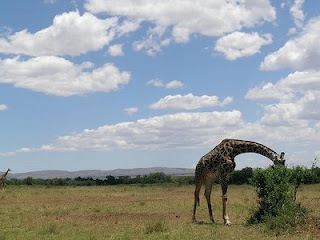 Photo: A giraffe in Maasai Mara, where their population has declined 95 percent over the last 15 years. Courtesy Flickr user angela7dreams.